WHY FIBER GOURMET - Our uniquely patented formula, the result of years of research and thousands of experiments, have produced the only pasta of its kind. 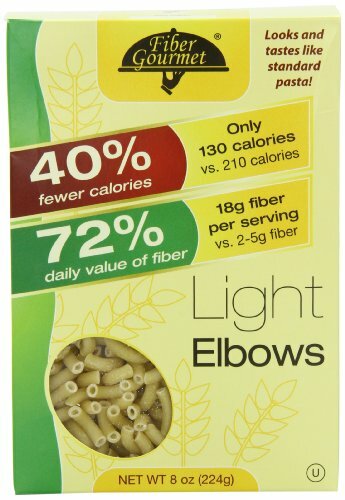 With only 130 calories per serving, our pasta provides less than half the calories and carbs of standard pastas. Our products have been featured on national TV on the Dr Oz show and Good Morning America. Why pay for fiber supplements? With 18g of fiber per serving now your daily dose can be nutritious and delicious. Why settle for less? A COMPANY YOU CAN TRUST - We are a proud all American company with all ingredients sourced in the USA. Our products are made in a state of the art, FDA-certified manufacturing facility meeting the highest cGMP standards. NO RISK - We're so confident that FiberGourmet will meet your expectations, so we're taking all the risk. Try our trusted products for 30 days - If you're unhappy with our product, just let us know and you will receive a full refund, no questions asked, no hassles. You've got nothing to lose. If you have any questions about this product by Fiber Gourmet, contact us by completing and submitting the form below. If you are looking for a specif part number, please include it with your message.